This collection consists of records related to Asa Hutchinson, Congressman from Arkansas’s Third Congressional District. 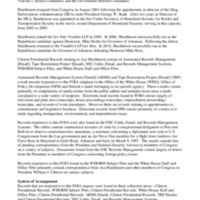 Records in this collection include: email, television and print news transcripts, house proceedings transcripts, impeachment proceedings transcripts, and records of event attendance. Many email concern immigration, environmental, and impeachment issues. 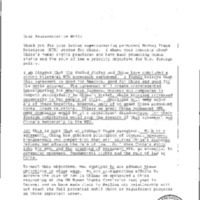 The collection includes cables summarizing accounts of visits by a congressional delegation to Peru and Bolivia to observe counternarcotics operations; a summary concerning a diplomatic note sent to U.S. Congressmen from the Lao government; and an Air Force One manifest for a flight from Andrews Air Force Base in Maryland to Little Rock, Arkansas and back on March 4, 1997. The remainder of the collection consists of correspondence from Asa Hutchinson and other members of Congress to President William J. Clinton on various subjects.